There's only one resort on the north shore of Oahu, and it's a very special place! 'The North Shore's residents are very vigilant about resort development. This has kept this very special part of paradise unspoiled for residents and visitors alike. Come to get a feel for Oahu's countryside, even if you can't spend your vacation here. And arrive hungry - the shrimp trucks are famous for their yummy plates! Surrounded on three sides by water, most rooms have a breathtaking view of the ocean. Feel the blowing tradewinds and the sounds of the sea as you relax on your private lanai. The gorgeous Hawaiian scenery goes on for miles as the north coast is under developed. With a more private location away from the main resort fronting the sea, you can fall asleep to the crashing surf. The cottages have just undergone a contemporary "beach house" style renovation and have a more upscale feel than rooms in the main building. Amenities include a private concierge on hand to help you make the most of your visit to Oahu. They're an ideal choice for a chill honeymoon! 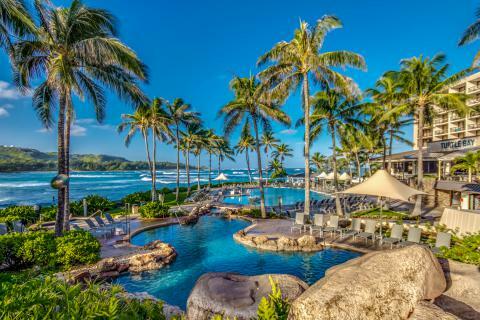 When you're ready for some action and adventure in the ocean or on land, the Turtle Bay Resort is the place to be. Surfing lessons, horse back riding, even an unforgettable helicopter ride from the resort's heliport are just a few of the attractions at hand.